For other uses, see Canonization (disambiguation). The first persons honored as saints were the martyrs. Pious legends of their deaths were considered affirmations of the truth of their faith in Christ. The Roman Rite's Canon of the Mass contains only the names of martyrs, along with that of the Blessed Virgin Mary and, since 1962, that of St. Joseph her spouse. By the fourth century, however, "confessors"—people who had confessed their faith not by dying but by word and life—began to be venerated publicly. Examples of such people are Saint Hilarion and Saint Ephrem the Syrian in the East, and Saint Martin of Tours and Saint Hilary of Poitiers in the West. Their names were inserted in the diptychs, the lists of saints explicitly venerated in the liturgy, and their tombs were honoured in like manner as those of the martyrs. Since the witness of their lives was not as unequivocal as that of the martyrs, they were venerated publicly only with the approval by the local bishop. This process is often referred to as "local canonization". This approval was required even for veneration of a reputed martyr. In his history of the Donatist heresy, Saint Optatus recounts that at Carthage a Catholic matron, named Lucilla, incurred the censures of the Church for having kissed the relics of a reputed martyr whose claims to martyrdom had not been juridically proved. 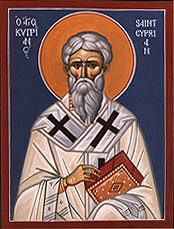 And Saint Cyprian (died 258) recommended that the utmost diligence be observed in investigating the claims of those who were said to have died for the faith. All the circumstances accompanying the martyrdom were to be inquired into; the faith of those who suffered, and the motives that animated them were to be rigorously examined, in order to prevent the recognition of undeserving persons. Evidence was sought from the court records of the trials or from people who had been present at the trials. Augustine of Hippo (died 430) tells of the procedure which was followed in his day for the recognition of a martyr. The bishop of the diocese in which the martyrdom took place set up a canonical process for conducting the inquiry with the utmost severity. The acts of the process were sent either to the metropolitan or primate, who carefully examined the cause, and, after consultation with the suffragan bishops, declared whether the deceased was worthy of the name of 'martyr' and public veneration. Acts of formal recognition, such as the erection of an altar over the saint's tomb or transferring the saint's relics to a church, were preceded by formal inquiries into the sanctity of the person's life and the miracles attributed to that person's intercession. Such acts of recognition of a saint were authoritative, in the strict sense, only for the diocese or ecclesiastical province for which they were issued, but with the spread of the fame of a saint, were often accepted elsewhere also.